Here are some of the leather items fashion trends you could have seen in Sipiel in March. Multi-coloured vibrations in gradation confuse our vision. Blocks of colours intermix and merge through plant-like motifs. A multitude of flowers of different sizes make up a highly cheerful whole. Camouflaged images of striking proliferation, based on a pointillist effect. 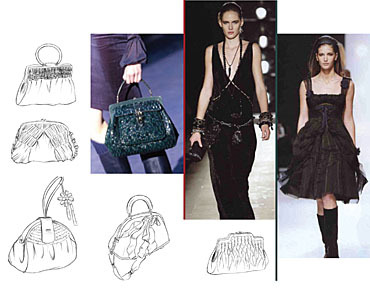 Bags armed with buckles, leather reinforcements, pieces of fur and thickened suede. Wrinkled details. The riding look is a point of reference for today's woman. An entire series of metallic fittings, such as fasteners and hooks, complete this horsewoman's image. The female figure is enveloped in natural protective materials such as leather and fur. Large bags made of soft types of leather. A combination of nobuck and leather. Complementary details include braided strips and riveting. The laws of space, as dictated by geometry, constitute an innovative type of chic. Lines inspired by and derived from military uniform in a female version. Very simple and well-proportioned shapes, based on mathematical rigour and exactitude. Good finishes are the result of a precise work of engineering. Embossed, thickened and semi-matt varieties of leather. Gros grain ribbon handles. Button and bow details. The 18th century is reworked in an innovative approach. The most important aspect focuses on sinuous lines. Through textures and materials we receive a tactile message, a message of soft sponginess. Delicate surfaces based on the subtle and fragile effect of porcelain. Whimsical shapes assume an anatomical profile. 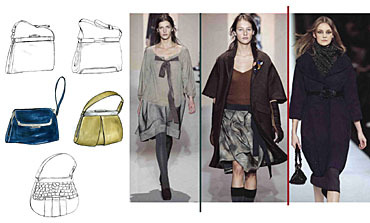 A variety of elements decorate the surface of these bags, which are made of materials such as varnished leather: pleats, gathered effects, flowers and feathers. Quiet corners with a poetic day-to-day charm. Wooden dolls painted and decorated in traditional style. Materials of private cultivation, taken from nature. Small details that inspire confidence. Spongy graphic jacquards envelop the body in order to face the winter. The regional touch is of Provençal character and decidedly handcrafted. 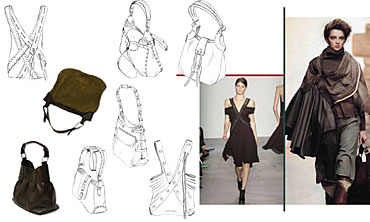 A combination of rigid and soft materials for the surfaces of these bags and their handles. Gondola and square-type formats. 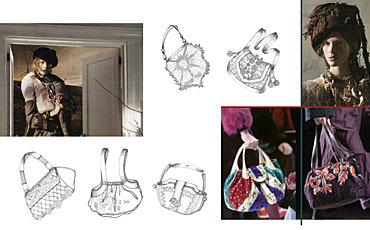 Decoration is based on the use of elements such as pompoms and designs created through crochet-work. Audacious and ingenious lines design the space in which we circulate today. Ambiences that announce the arrival of the immediate future and which combine elements of the past with innovation. The practical comfort and convenience of sports design is combined with an elegant urban profile, one that is decidedly majestic at times. Basic materials are transformed through the use of the latest technology by being combined with artificial fibres. 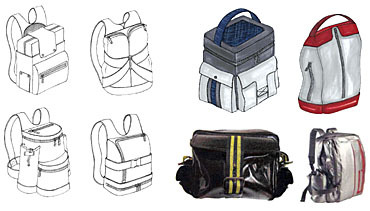 Knapsacks that have a reworked appeal, equipped with different spaces. 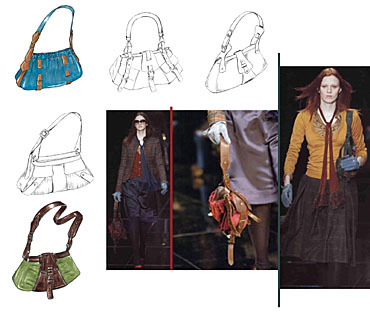 Sections separated by matching zips and two-colour material combinations.